Most of us weekend breaks fromWe exhausting stress of megacities in the cottages and country houses. Many spend their holidays there and seriously think about moving to a permanent residence in a village house. But some do, leaving a comfortable city apartment. What draws us to the ecology apart? Another way of life, other values. And our homes. Let's talk about the interior of a village house. Not a country cottage, namely farmhouse. 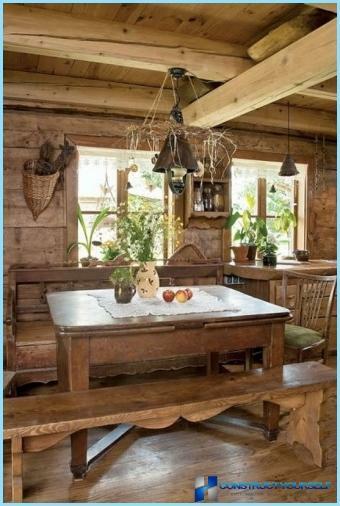 It should be noted that the Russian style interiorvillage house is different from the American style of "country" or from the interior English style house in the rural wilderness. Other habitat, different customs, a very different flavor. 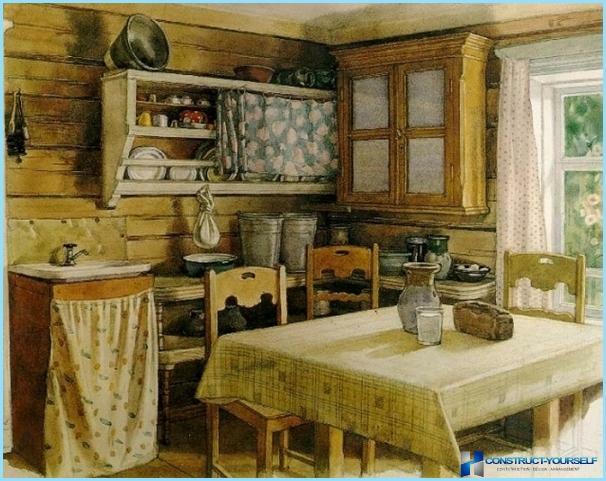 Design of houses in country style has become fashionable in Russia in the second half of the last century. Then on the country's share fell terrible trials and was not up to the style of the interior. In a fashion interior village house began to return only a century and continues to be popular to this day. It is about lifestyle and design houses in our villages before the total devastation of the economy and in their heads, as used to say, Professor Preobrazhensky. If it is a peasant village houses, it was, for the most part, strong economy. If a noble - conscious playing the most attractive features of this life, in many ways contrary to the prevailing fashion in society. The main materials in the finishing of country house - wood and stone. Finishing made simple, even rude. Mostly wooden furniture, thorough,High-quality, but without any frills. Special Q differ chests and dressers. There are things forged furniture. 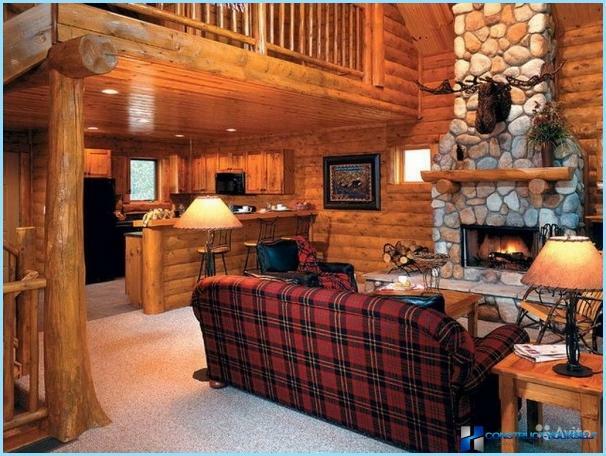 The modern interpretation of country style is used, and wicker furniture. Many interior items made the owners of the house. Or, as it is fashionable today, made in the old techniques. A lot of textile products made of linen, chintz,burlap or cotton, including woven hands hostess. These are things simple, sturdy, made with a soul for himself. The prevailing bright colors. 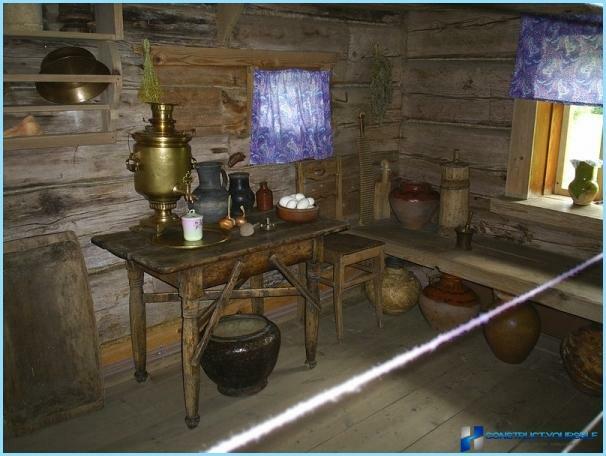 For Russian houses required large Russian stove, which is in the homes of our ancestors performed, except heating and a host of other functions. 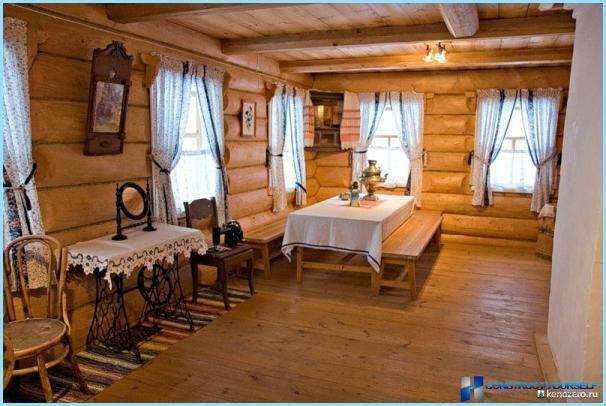 Other features Russian rustic style: the log walls of the hut, carved cornices and architraves, wood in the interior. Required samovar, which is in the economy occupied a special position. 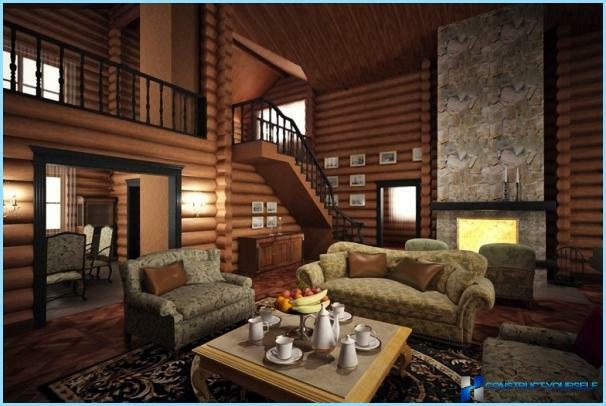 All these elements of the interior must make a comfortable village house, cozy, warm. 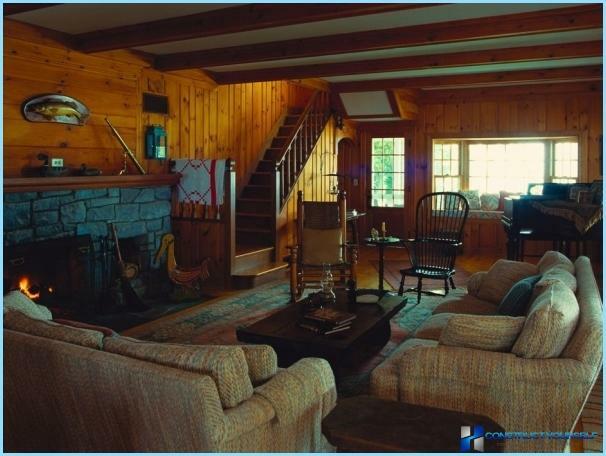 The cottage living room - a large gathering placefamily, the main room in the house. 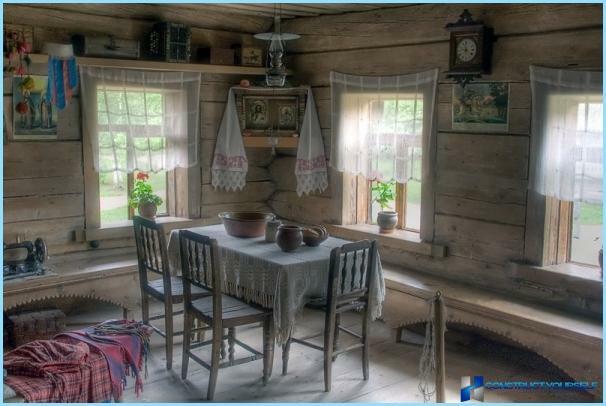 Play a real Russian village house interior middle of the XIX century is not possible and not necessary. 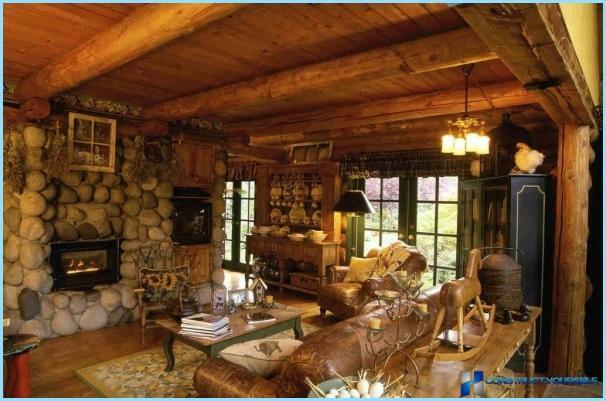 However, if you wish, you can arrange the living room and the whole house with the preservation of certain traditions. Let's start from the floor. It is better to lay a nice wooden floor and then paint it. As a floor covering can choose massive floorboard or laminate that mimics wood floor. On the floor will look good colorful woven mat. Steles on the floor in a cottage in the carpet, the more fluffy, it hardly makes sense. 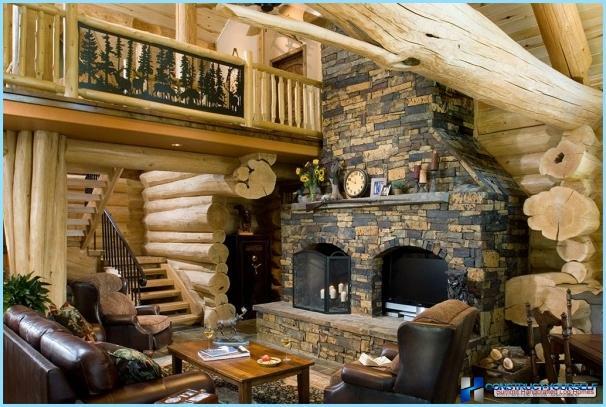 To finish the walls of the living room country house can beuse the block-house, or an imitation of timber. Wooden wall covering is treated with antiseptic and fire-fighting compounds and, if desired toned. The stone house is worth finishing the walls to make decorative plaster rustic or pokleit simple paper wallpaper with floral pattern. The color scheme chosen under the furniture. The ceiling is painted with white paint or coveredwhitewash. With painted white ceiling will look good false beams. They can make your own or buy ready-made from polyurethane. 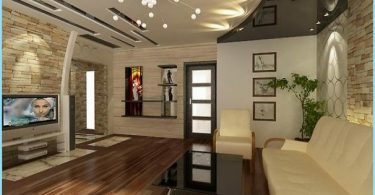 Beams should contrast with the dark color against a white ceiling. Furniture selected on the basis of your ability. 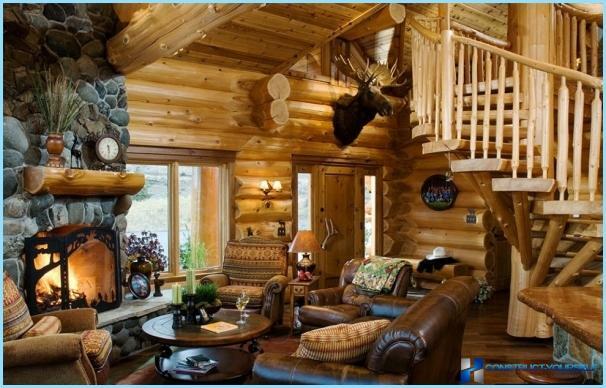 It is advisable to arrange the living room wooden furniture, solid enough. It will find its place in a rustic interior furniture with wrought iron elements (chairs, tables, desks) and wicker furniture. Remarkably will look old and renovated dresser or chest. Only the restoration of the rarity of this piece of furniture should not destroy the traces of his deserved age. 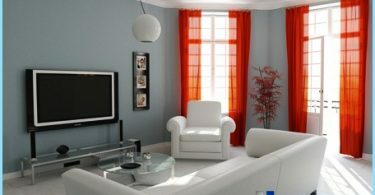 It is this will add flavor and make it the main focus of the living room interior. The living room should have at least one sofaand a couple of armchairs. This place is relaxing conversations and contemplation of the flame in the fireplace. Pillows pillow cases made from natural fabrics, especially linked with his own hands, will make the sofa even more comfortable and relaxing. On the shelves in the living room cute trinkets and funny figurines made of wood or clay complement the interior living room. They can be arranged on the delicate tissues, such as cloth put on the table. Creates a rustic atmosphere at home is not worthdestroy modern lighting fixtures. Save the style, using lamps with lampshades, lamps and chandeliers in a rustic style. They shine a warm yellowish light that you need and to fill the living room comfort. Very important! 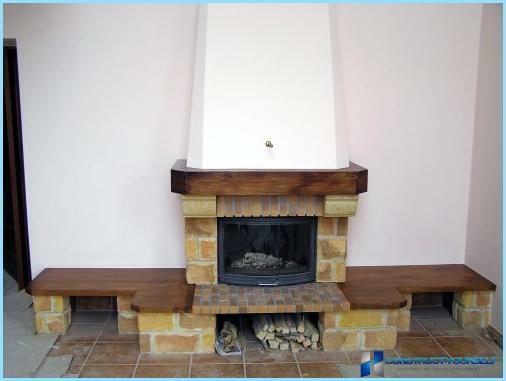 The main question - a fireplace or stove. A real Russian oven can only add upprofessional. Speciality is a rare and highly demanded. Pecnik to good people in the queue waiting for a few years. 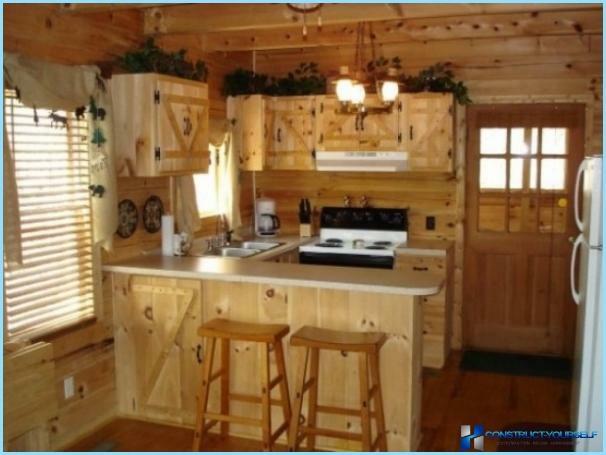 However, a fireplace in the "country" style does not spoil, as they say, Mass. 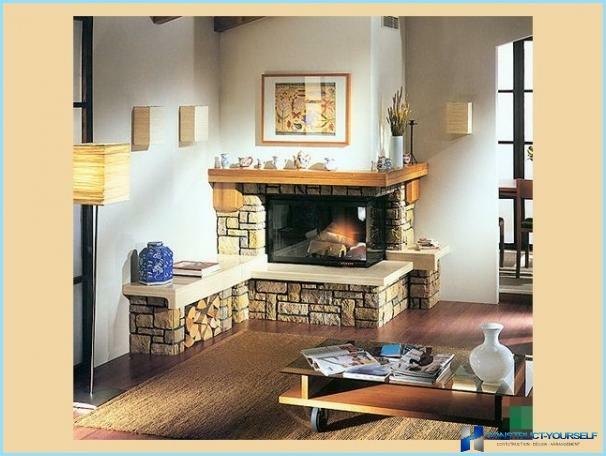 Built of puncture sandstone blocks in warm colors, with decorative elements and polished solid wood mantel it will be appropriate in the interior. And you will be able to reap the benefits of technological progress, without departing from the selected style. 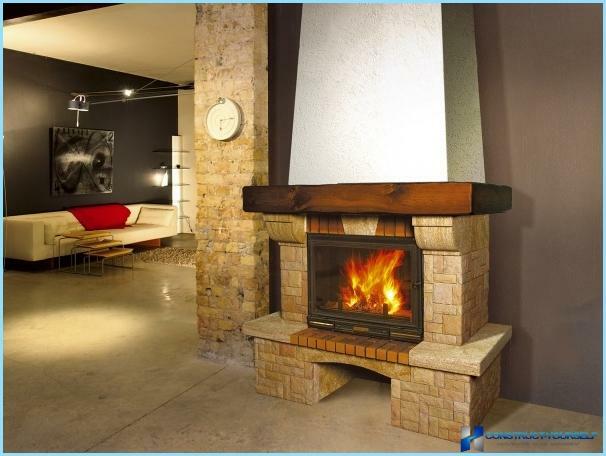 Furnaces of fireplaces usually have a very high efficiency, and are equipped with forced hot air on the hidden connections in other rooms at home. 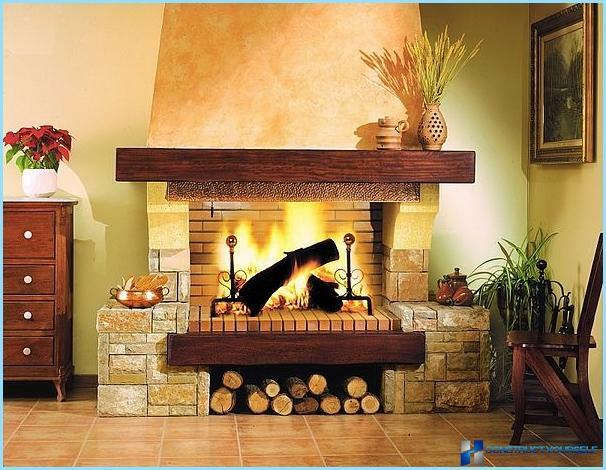 So you not only the living room country house decorate a beautiful fireplace, and the house to heat efficiently. A heat-resistant glass door of the furnace chimney in the evening will be very pleased to enjoy dancing flames in the firebox. I must admit that with all the advantages of the Russian stove, heat-resistant glass door, it does not matter. The second most important room in a country house - the kitchen. 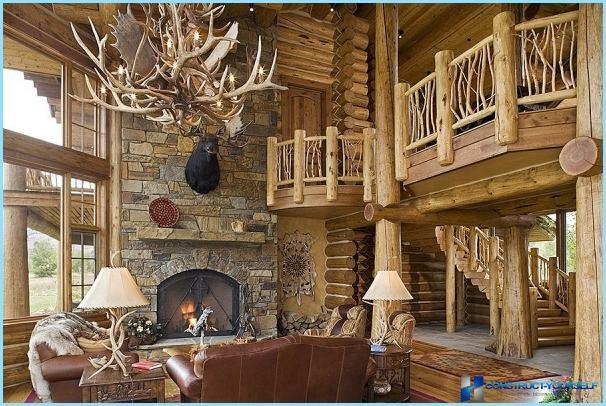 Keeping the style of the interior, without giving up the benefits of civilization. The style was very similar to the interior of the living roomcountry house: wooden floors or floors made of solid wood flooring, bleached or painted ceiling. If the size of the kitchen allows, do not give up false beams on the ceiling. Raised beams have to be dark in color and contrast with the white ceiling. Decorating the walls depends on their material. Wooden walls can also be oblitsevat blockhouse or imitation logs. Brick wall tiles, it is desirable to impose a weathered brick. The choice of colors will be determined by the color of the furniture - do not choose too saturated with light color tiles kitchen furniture. At least part of the furniture should be wooden. Or have a wooden facade. Facades can be decorated with carvings. Modern kitchen appliances can also hide behind the wooden facades, but it's a matter of taste. Everything else - at your discretion. Beautifully will look in the kitchen in rustic clay pots, decorative plates, embroidered towels, bundles of onions and garlic. On the floor throw rag rug. Such villages crochet. And on the windows hang lacy white curtains. Lighting fixtures can be arranged in the form of bright yellow flowers. 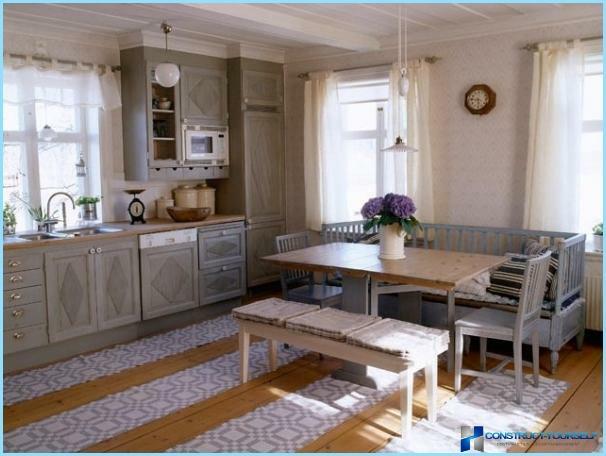 A great idea is to install around the table wooden benches, the laid crochet bedspreads. And do not forget to set the table bellied samovar! Rustic other premiseshome depends on you. You can confine kitchen and living room, you can draw in this style all the rooms. The main thing is that your house was cozy, comfortable and warm. Contents Interior rustic you are quite capable. Moreover, doing this finished, retract in the process, learn a lot of interesting things and be able to competently discuss the future with any specialist in rustic style in the interior.